The power of story!! I love it when kids make connections to stories we have read. This week we have been reflecting on our experiences with Rachel's Challenge. 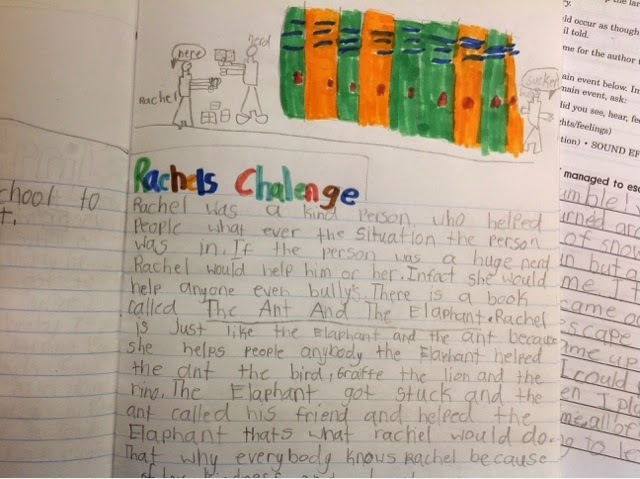 One of my students wrote about how Rachel's Challenge is similar to the book that we read called The Ant and the Elephant. I was surprised to read his entry because we read the book a long time ago and really haven't talked about it since. I also love that he underlined the title. This week I mentioned to them that when you write the title of a book in a sentence, we usually underline it.